Hinted at, but left to the reader’s imagination at the conclusion of THE BOOK OF THE NEW SUN, The Urth of the New Sun is the story of Severian’s final judgment to determine whether he, and subsequently Urth, are commendable enough to have their dying sun revitalized. The story opens on a spaceship of proportions nearly impossible to visualize. Severian is on his way to Yesod, the planet where he will plead his case. When Severian climbs the ship’s rigging to toss his memoirs from NEW SUN into space, not everything goes as planned. Severian soon finds himself caught up in strange events: a murder, a hollow android, aliens, the Hierodules, and a zoo of strange proportions. Eventually put on trial, characters from NEW SUN return to offer witness and testimony, and whether Severian and Urth are worthy of redemption is never a certain thing. If fantastical ideas were a treat in NEW SUN, they carry over in Urth. Wolfe continues to offer a visual story that is a joy to imagine. The space-spanning ship, the bizarre events leading up to the trial, and, in particular, the cycles of life in the denouement, show the author is still in form creatively. What doesn’t carry over, however, is the mode of storytelling. Abandoning the bildungsroman format which saw Severian develop from a naïve young man into a responsible leader, the focus of Urth is on aggregating the deeds which comprised his development into a cohesive statement that defines whether he is worthy of redemption. Tzadzekiel presiding over the procedural, Severian must now face those who died in NEW SUN, including Thecla and Master Malrubius, as his case is discussed. Presented in less overt form in THE BOOK OF THE NEW SUN, Urth collects this input, delivering judgment and its aftermath in closing fashion. Keeping standards high, the resolution is chock-full of symbolism in interesting and often surprising forms. In the end, Urth of the New Sun is not an integral part of THE BOOK OF THE NEW SUN. It is, however, enjoyable reading that confirms the ideas and themes at work in the series, with fresh imagination in a new setting. Starting as a straightforward story, shifting gears once the trial begins, then dividing itself into parallel narratives toward the conclusion, it’s possible that readers perplexed by THE BOOK OF THE NEW SUN who expect a transparent narrative that answers all their questions will only be further disappointed by Urth. (I have read comments on Urth likewise declaring it inexplicable nonsense). And it’s true; Urth is not as accessible as THE BOOK OF THE LONG SUN or The Wizard Knight. If you were put off by NEW SUN, Urth will probably only further disappoint. Nevertheless, it does encompass all of Wolfe’s ideas in less disguised form. The bottom line is, if you read and followed NEW SUN, Urth will probably not reveal anything new and spectacular. It is, after all, a summation in a different mode rather than a linear progression of the overall storyline. However, if you fell in love with Wolfe’s style in NEW SUN and want more of the same imagination, narrative games, and rich content, then check out Urth. It may be extraneous, but it’s still enjoyable. Thanks for this review Jesse. 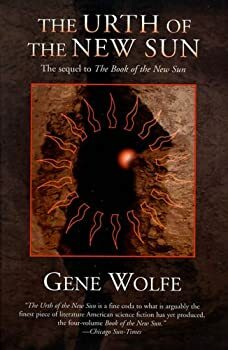 As you know, I struggled with Wolfe’s short stories, but I really do like his Book of the New Sun tetralogy (which I’ve read twice) and read The Urth of the New Sun several years ago. As you said, it’s not so much a sequel as a repackaging of the ideas of the main series, though it may obfuscate as much as it clarifies. Still, it does address the actual trial of Severian aboard the giant spaceship. Suffice to say that journey is exceedingly strange, and the events and characters are truly mysterious. I also felt like I was walking on the surface and there was hidden meaning below that I could only sense like the heat from magma flowing below the dried lava above. I think I’ll revisit again someday, hopefully armed with enough erudition to make it worthwhile. Apologies for the late reply. Was on holiday. Along with the actual trial, I thought the ending of Urth, and how it goes through a hyper-realized cycle of existence, also does a good job of highlighting the theme of personal and social development. It gives a temporal context the tetralogy didn’t have – and didn’t need, but is helpful toward understanding.